The power of the Internet - bringing fisherman together. Love it or hate it the Internet is bringing fisherman together. Sites like WFN, show tips and tricks and help get information to the masses. Then there are localized sites out there with forums that help fishermen in the same communities to share information. This is where people?s opinions drastically differ; they worry about hot spotting, ruining a fishery, and many other things. My opinion is it brings fisherman together that otherwise would of never met.This weekend was the website I run, 2nd Annual BBQ and Fly Swap get together. Basically members of my website descend on a particular body of water for a BBQ and to swap flies with those that signed up. The first year we did it we had 6 people show up, on its 2nd running we doubled that and hit up the South Platte River in 11mile Canyon. 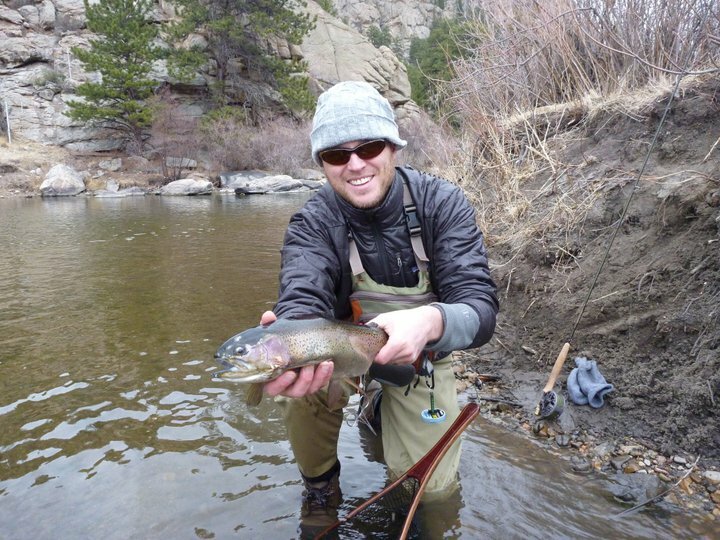 If you have never fished 11mile Canyon it is one of the great tailwaters of Colorado. 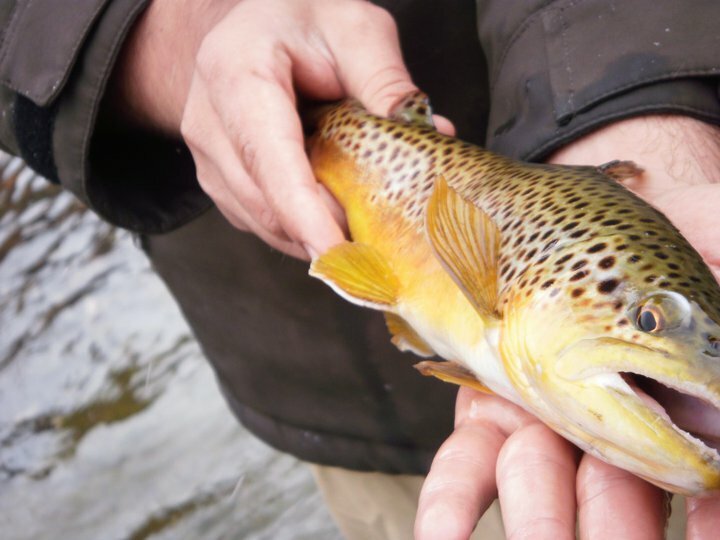 The river is fishable year round and holds a high number of quality fish, which get better every year due to its catch and release and its harvest sections it also is not as technical as some of the other quality tailwaters we have here in Colorado. With some of our members fishing this section regularly some have never been there, so it was a perfect canidate for the BBQ.For a Saturday the river was pretty empty as I pulled into the top hole at 7am, finding a car load of members rigging up their poles and no one else. 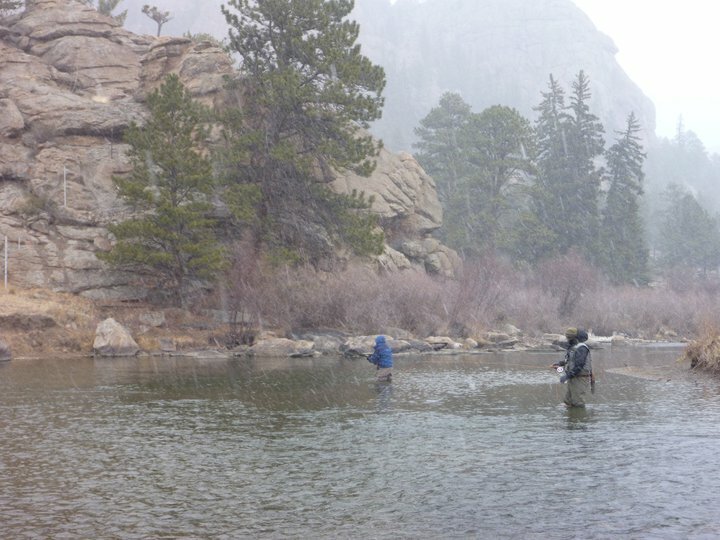 The temps were low but not too bad, however by time I rigged the pole up and headed to the water the temps had dropped 15 degrees and the snow started to fly. It was one of those bitter cold days fishing where your fingers stop working, the only time you were warm was when the adrenaline of fighting a fish kicked in or you were sitting in the car with the heater running so you could tie new flies on your line. One of those days if it wasn?t for the company we had it probably would have been a short day fishing. 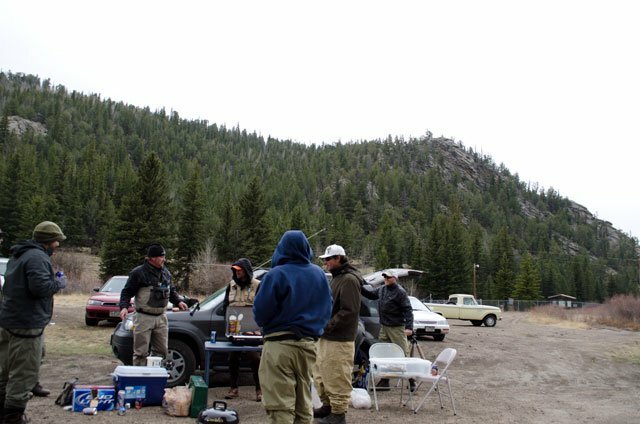 As the rest of the members arrived from fishing spots downstream we set up the BBQ began cooking, drank a few adult beverages, shared fish stories old and new, and swapped flies. Over 100 fish were landed multiple species caught with everyone catching some, no pattern ever really emerged as soon as you caught a couple with one fly it would stop working? 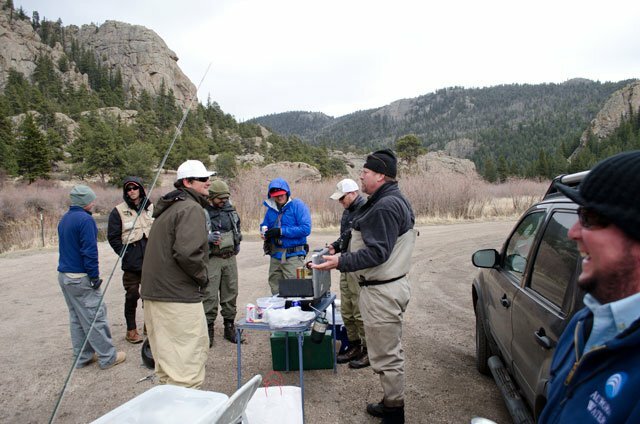 show the education levels of some Colorado tailwater fish. With everyone having at least an hour to drive to get home we wrapped things up around 4:30pm, bringing an end to another successful event that would of never happened without a website to bring it together. If this sounds like a good time to you I recommend you find a fishing site in your area and become a member, share some information, gain some information, enjoy the get together and find some new fishing partners. 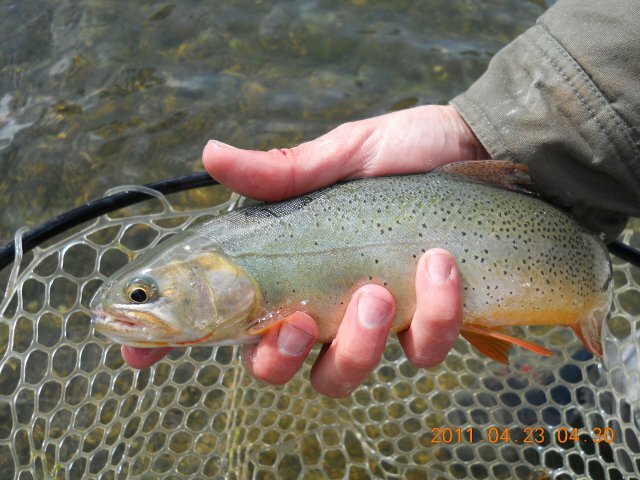 If you are in Colorado my website is geared more to high mountain backcountry fishing here in Colorado; www.ColoradoMountainFishing.com, I also help run www.ColoradoFisherman.com, and blog for www.FishExplorer.com all Colorado based fishing forums that have similar events and great information about fishing in Colorado.